Today is Monday 17th March, which marks not just the end of St Edmundsbury's Zero Waste Week, but the end of my personal 8 week challenge to reduce the amount of waste that my family sends to landfill. And that's it....Just one itty bitty first-aid plaster (band-aid), from when I cut my finger last Monday! If you look carefully at the photo, you can see it sitting on wheel of the bin! ...and that really is the total amount of landfill rubbish that our family has created in one whole week! There was almost my tube of toothpaste, which Mr A tried to bung in the bin, but I rescued it, rolled it up and gave it some extra squeezes and I reckon I've got another day before its contents are exhausted. As it's Zero Waste Week and I possess the tenacity of a dog with a bone, I was determined that nothing else was going to be thrown away. I have already declared the plaster, despite a couple of suggestions to burn it or run it down to the local hospital, but with my sense of fairness its only fate is landfill. However, I needed to do something with the rest of the stuff, which called for extreme measures. I discovered I could tear off the plastic film that coated the inside of the butter wrapper, but I was still unsure whether either of these components are recyclable. As for the cotton buds, I thought the best bet for those would be to stuff them in an old sock and bung them in with the next load of washing. They came out clean and I tore off the cotton wool and put it in the compost bin, which only left the thin plastic tubes. Hmmmm, not bad, but I said I was tenacious! No, not the 1980s Norwegian pop-group with the dulcit tones of Morton Harket, but my three year old who constantly begs for opportunities to make things. "Mess to Impress" is his tagline! So, I called him to my rescue and gave him some paper, glue and the little bits of rubbish that I'd rescued from the bin. He couldn't believe his luck and got to work on some junk art, combining the plastic tubes, sellotape and butter wrappers with other bits that he's collected, all following the principles of "Reuse". It's a bit abstract, which could be appropriate when I think back to my challenges with recycling. He couldn't think of an appropriate name for it, but I'm going to call it "Unburied Treasures". One thing's for certain, I daren't ever throw it away but I suppose I could always put it on eBay and hope for a fiver. And that's where the story of my own Rubbish Diet challenge ends....at the end of Zero Waste Week, with our black bin containing just one plaster! Personally, I am amazed at the results. Even though it set out as a challenge to reduce my rubbish, the effects on other areas of my lifestyle have been incredible. I now spend less on food and am more thrifty. I am more organised with shopping activities and have got into a routine of using a range of outlets, which provide more eco-friendly options. What has been great is the immense enthusiasm and support from the Internet Community. The comments have been fantastic and inspirational and it is the advice from our "unsung heroes" from across the globe that has led to the success of my own personal challenge. I would like to thank all contributors who have made suggestions, sent comments of motivation, shared their stories and have helped to promote the wider issues. Big thanks also go to Woman's Hour, Radio Suffolk, Ireland's Newstalk, Sustained Magazine and East Anglian Daily Times for promoting the blog and the challenge. I never expected it to get such attention, but it's been great and I owe a big thank you to Cybele at Freecycle for that. Thanks also to Wiggly Wigglers for helping with my composting queries and inviting me onto their podcast, which is coming up this week. I would also like to extend special thanks to Melanie Rimmer at Beansprouts for her great tips at the beginning of the challenge as well as Kate McFarland at Edmundsbury Council Council for her advice along the way. As well as to all my friends, thanks also go to Tracey Smith at International Downshifting Week for being a fabulous mentor and to my good friend Christina Surdhar of About Bury for sticking by me, allowing me to extend my deadlines and letting me bore her with my talks of rubbish! I'm sorry if I've omitted a mention, but it's beginning to sound like an Oscar speech! However, I would like to make one last thank you. The biggest thanks go to Mr A and the Junior Posse, for putting up with my ideas and my nagging over the last few months. Thank you guys for the big effort you've made and long may it continue. You know it's worth it. So what's next? Well, Mr A has been so bowled over by the results of The Rubbish Diet, that he now wants me to move onto tackling our Clutter, Energy use and Spending, but first things first Mr A. 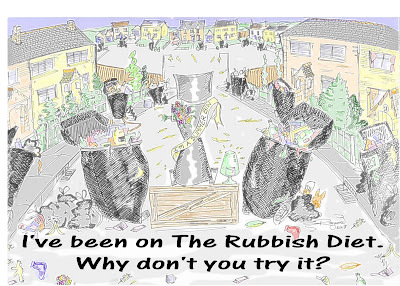 We've got to make sure the rubbish is kept down before we go onto the next challenge, which means The Rubbish Diet is here to stay for a little while longer. I know I said it would be just eight weeks, but there's so much that's been left unexplored and I am now officially hooked! So what can you expect from here-on in? Waste Management in Switzerland, a country which has the reputation of being one of the top recyclers in the world. How restaurants cope with food waste? Getting the low-down from packaging companies, how do they see the future? What happens at a materials recycling facility? More solutions for recycling some of the tricky little things. Some fabulous products made from recycled materials. Indeed profiling anyone in the production/waste stream that is making interesting progress in the right direction. I might even ask Gordon Brown about his own rubbish! Strange, but I'm now finding the idea of rummaging through the trash at No. 10 quite appealing. I am also going to include a series on our "unsung heroes", profiling stories from people who are already making the effort, no matter how long they've been doing it or why. Whether it's down to a generational difference, lack of money or concern for the environment, it's other people's experiences that are truly motivating, so please send me your stories as it would be great to promote case studies that illustrate best practice and which help to inspire others. The site will also feature the progress of other people who decide to take up The Rubbish Diet and attempt Zero Waste for themselves. So, if you would like to rise to the challenge, get some help and feature your story here, then please get in touch. All enquiries and information should be sent to enquiries@therubbishidet.co.uk. And now I'm off to celebrate...but not with champagne .... oh no! because for the first time in my life as a responsible adult...there's no need to.....HOORAY! Indeed, if I keep this up, I won't have to put it out for weeks or months! In the meantime, I am going to leave you with a final message in the form of an illustration that I commissioned from the brilliant artist Ray Smith of www.thegreenpen.co.uk. For best effect, click on the picture to enlarge it and enjoy! There are more great cartoons at Ray's website, so if you're in need of a distraction, I recommend that you go and have a look. It's been great fun following your progress and very educational too, and I'm glad you're carrying on with the blog. Talking rubbish seems to be an inexhaustable subject! Wow - what an incredible achievement, well done that woman and I know it takes the whole family to get on board to really make things work, so a big pat on the back to your back up team too! I look forward to following your grubby adventures and look forward to swapping dirty secrets with you in the future! That is amazing! I can't imagine having zero waste, especially while teenage/young adult son is still living with us, but you've inspired me to try and cut back more than we have so far. 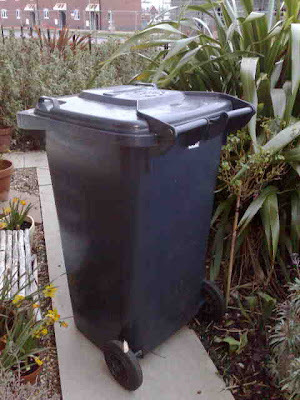 Since fortnightly collections started we have made a more determined effort to recycle and our big wheelie bin is usually less full at the end of the fortnight than it used to be at the end of the week. I've only started reading your january posts and you've already shown me I can recycle my aerosols and you've got me thinking we ought to invest in a green cone. That's just for starters. I'm very happy that you achieved your extraordinary result! All this time I checked up on the steps of your challenge looking at my rss reader and today I read the great news! A plaster and some little kind of waste is really nothing compared to the tenacity you practiced and the way you've modified your life now! It's wonderful that you'll go on writing on your blog. I hope I'll find the time to send you something more about the waste situation here in Italy. I'm very busy with my job everyday and I'm not so good writing reports (expecially in English), but I'll try! I want to see the look on the bin men's faces when they get to your bin! Well done, it is a truly great achievement. Congratulations, Mrs A. I knew you could do it, but I didn't expect the amount of media interest you got. Well done for promoting waste-reduction so effectively and good-humoured-ly. I love the junk-art picture, but I'm oddly relieved the used sticking plaster wasn't incorporated - although if it had you could have entered it for the Turner prize. 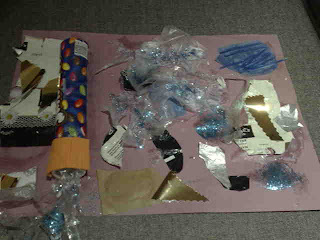 "He couldn't beleive his luck.." Oh, I miss the days of "junk art" projects! Kudos to you for your perseverence in managing your rubbish! It's really gotten me thinking. Hope this idea spreads to the US, or we'll all be up to our necks in trash in a few years. What a result! And thanks for giving it a go, your contribution helps us all, so I better return the favour and give it a go myself. Hi Cybele - thanks for the shout out and for the Woman's Hour tip off. T'was brilliant! Hi Despairing - dare I admit that I too was a cynic at the beginning. But eh, now I'm a changed woman...all for the better I hope. Hi Karin - thanks for doing the "catch-up" with the old posts. I think that fortnightly collections are definitely the way forward and I am glad to have come up with a system that helps the average household be less affected by fewer collections. Hi Picklesmum - I think that when it comes to the next collection. I should definitely stand in place of my bin and give them the teen weeny bag. Hi Mel - LOL, there's still hope for the plaster. I haven't managed to throw it out yet. I thought it would be a shame to waste a whole carrier bag on just one plaster, so I am waiting for it to fill up...hmm Turner price. You've now got me thinking. Perhaps I should just frame it in the name of art. Hello to the babas - thanks for your support guys. Question is, have you got onto your council yet? A big thanks to everyone for your support and encouragement. I know that blogger can be a pain to leave comments on, especially since I set up the anti-spam option which requires the code, so I really do appreciate the comments that you've made. Please keep participating and sharing stories and most of all...LET'S KEEP TALKING RUBBISH!